Horror Sci-fi and More! : THIRD TIME'S A CHARM??? 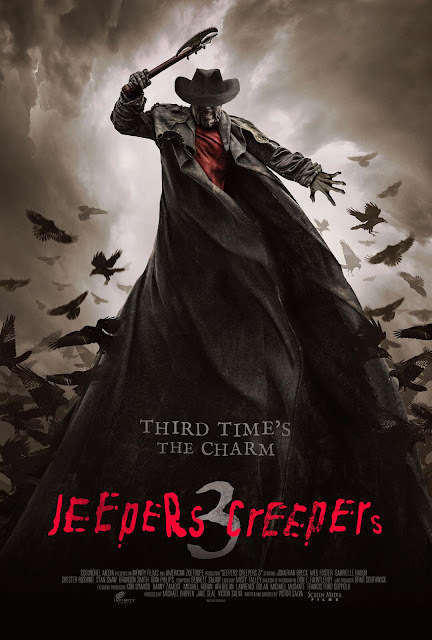 ARE YOU READY FOR JEEPERS CREEPERS 3? THIRD TIME'S A CHARM??? ARE YOU READY FOR JEEPERS CREEPERS 3? Theatrical Release Date: One-night event on Tuesday, September 26, 2017 at 7:00pm local time. Tickets available at www.jeepers3pers.com. On the last day of the Creeper’s twenty-three-day feeding frenzy, skeptical Sargent Tubbs teams up with a task force hell bent on destroying the Creeper for good. The Creeper fights back in gory glory as its enemies grow closer than ever before to learning the secret of its dark origins.